This is the reverse of the adverisement. In 1838 John Gray, a member of the Royal College of Surgeons, wrote of the 'great number of adventurers who have lately assumed the character of dentists without being either surgeons or mechanics'. At a time when there were no dental schools in England, and no regulation of the 'trade', it was very easy for an untrained person to advertise and operate as a dentist. The Dentists Act of 1878 established a Register of existing practitioners and specified that no one without dental or medical qualifications could be registered or use the title 'dentist' or 'dental practitioner'. However unregistered persons might still practise under alternative titles such as 'dental specialist', 'dental consultant' or 'dental expert'. 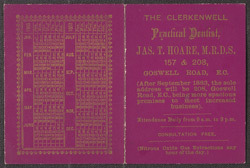 For both reputable dentist and charlatan the main profits came from the sale of false teeth - a service which is most prominently advertised here by the qualified surgeon dentist Jas. T. Hoare. By the end of the 19th century dentures were made of 'vulcanised' rubber which could be moulded and coloured to match the natural gum, and fitted with porcelain teeth. These would improve mastication and articulation, and a patient might even enjoy a more youthful appearance. Also advertised here is the use of nitrous oxide gas as an anaesthetic for extractions. By the final decades of the century this once excruciatingly painful operation might be relatively painless. Perhaps it is not surprising to note that Jas. T. Hoare, who advertised artificial teeth alongside painless treatment with nitrous oxide gas, was able to enjoy increased business and move into more spacious premises.